Hindsight Helps Produce Waterproof Historic Roof Designs. While a general study of original historic roof installations will reveal much impressive work, flashing details can sometimes appear naive and ineffective by modern standards. The original artisans were, like us, only mortal but, unlike us, they lacked the gift of hindsight. With this hindsight, we can read the record of their work and use what we learn to more effectively protect the historic fabric. For instructive examples of design failures drawn from direct observation, we have consulted with Rich Susca of Susca Roof Consulting, of Tolland, Connecticut, a lifelong student of waterproofing materials and techniques. CALL THE TIN MAN. This collection of bare wooden risers and ledges is no longer sustainable in wood and probably never was. The specification is to cover all of it in 20 oz. copper. In this instance, the most durable solution is also the most economical. In fairness to the original artisans, who aren’t here to defend themselves, Rich Susca points out that faith in half measures is hardly out of style. For example, he cites a modern specification called a “termination bar”, a structurally reinforced counterflashing fastened to masonry above wall flashing. This flashing method depends on a bead of caulk to seal the installation. A recent project called for a flat seamed and soldered copper roof, an installation rated to last seventy-five years, counterflashed by this detail which depends on caulk expected to last five. That adds up to a very elaborate five year roof. Rich Susca recommended cutting reglets into the masonry and imbedding counterflashing into the wall but was told that such alterations would compromise the original historic fabric. He believes that the greater threat to the historic fabric is an unreliable flashing detail, and suspects that such choices are often motivated by a desire to save the cost of cutting and installing effective flashing. If so, he notes, it is a poor economy. Boneheaded as such economies may seem, he finds considerable precedence for them in original historic work, citing a similar detail from the 1884 installation of a standing seamed metal roof on the Benedict Miller House in Waterbury. As in the case above, the materials and craftsmanship were impressive until you got to the wall detail where the wall flashing was simply and crudely nailed off to the masonry joints of the brick wall and caulked, lacking even the reassurance of the “termination bar”. The assumption seemed to be that there was sufficient overhang from the eaves above to protect the area from concentrated runoff. This treatment inaugurated over a century of periodic failures of the caulk joint and consequent leaking ended only by the recent replacement of the roof. This time, however, joints in the brickwork were cut out and counterflashing installed. Such wall details are less easily addressed when they come up against flat wood trim or siding. There, historic installations often fail to run behind the woodwork typically relying on caulk and face nailing. 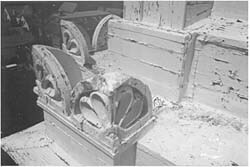 Where possible, the woodwork should be disassembled or cut away to a height sufficient for introduction of flashing behind it, allowing the woodwork itself to counter the flashing. There are cases, Rich observes, where structural considerations won’t allow this backflashing. Vertical Greek Revival pilasters, for instance, are sometimes continuous and self supporting and will not accept undercuts. In these instances, it may be possible to install a narrow reglet into the wood itself into which counterflashing can be introduced. Great care must be taken that the wood is stable enough and thick enough to support such a solution or it may do more damage than the caulked and face nailed detail it presumes to improve upon. A common failure of historic roofs in colder climates is caused by the formation of “ice dams” along roof eaves, at the outflows of valleys and on northern exposures where ice is permitted to accumulate. During thaws, these dams can redirect substantial water flows through shingled areas into the building and, in addition, damage slate when they eventually break up. Installation of sheet metal “ice belts” over these areas is an effective and traditional solution for both these problems but at the cost of a considerably altered appearance. Where such alteration is unacceptable, these areas can be reliably waterproofed by the installation of an underlayment of modern “ice and water shield” membrane, an effective measure over historic substrates and under slate. Backup membranes, of course, do nothing to prevent the damage ice dams can do to the slate. ZERO MAINTENANCE. That is how much maintenance the building owner would prefer to do. The modern standard is to get as close as possible to that with fully counterflashed installations. 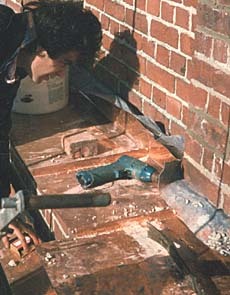 Here, a tinsmith installs copper pans behind sheet lead imbedded in the brickwork. Damage to wood or masonry elements adjacent to a roof area may indicate that these elements are receiving more runoff than they can sustain. The most durable solution may be to clad parts of these elements in sheet metal to protect them from the heavy water flows. This is often a popular strategy with owners since, for once, the most effective solution is also the most economical in that cladding an element often costs less than reproducing the original fabric. Usually, this strategy entails running flashing a clapboard higher on a wall or cladding a wood ledge over a window or at the base of a pediment. In a recent project, Rich Susca found that a brownstone window sill rotted because it sat nearly level with the wall flashing of a roof just below where it was subject to splashback. Rather than replace the brownstone element, they cladded it and incorporated it as a contiguous part of the roof replacement. The wood window sill above it was cut free of the jambs and temporarily removed so that a copper pan could be installed full under it. Purists may object, but it is probable that that location is not a sustainable one for a material prone to freeze thaw damage such as brownstone. Formerly, active maintenance of roof systems was considered a given and that assumption may have permitted the flaws noted above. Casual flashing details would be subjected to a certain level of ongoing scrutiny. Roofers, for instance, would often remove ice dams from valleys and eaves in season as part of normal maintenance. Such maintenance is no longer considered normal or acceptable. Rich Susca notes trends such as the use of larger capacity scuppers and other rain carrying equipment so as to reduce obstructions and the need for maintenance. Like most building systems, roofs are subject to rising expectations. The work left by the original artisans will continue be an invaluable template for those seeking to devise waterproof installations to modern standards. List of Roof Restoration Consultants. List of Roof Restoration Contractors. This entry was posted in Roof Restoration and tagged Connecticut. Bookmark the permalink.